There are more than 73,000 homeless people on any given night in Los Angeles County; more than half of them are in the City of Los Angeles. Peter Samuelson, a media executive who founded three major children’s philanthropies: the Starlight Children’s Foundation, the Starbright Foundation and First Star, began to notice the high number of homeless women, men and children during his bike rides between his home in Westwood, Los Angeles to Santa Monica Beach. 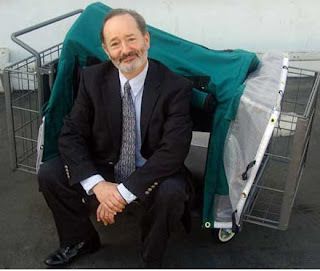 Having lost count after 62 homeless people, Peter set out on a mission to conceptualize and build a mobile shelter – later named EDAR – to help improve the quality of life for those living in the streets. 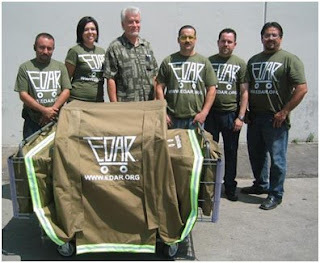 The idea for EDAR, which stands for Everybody Deserves a Roof, was born after Peter interviewed 62 of the individuals he witnessed living in the streets who shared their desire for a shelter that could be mobile, safe, durable, elevated off the concrete and could facilitate recycling - a principal source of income for many homeless individuals. Once he understood his challenges, he set out to create the design. For the design, Peter turned to the students of the Pasadena Art Center College of Design who were most eager for the opportunity to share their creative design ideas with the world. There, Peter launched a design competition – modeled after The X PRIZE Foundation’s successful model for incentive prize competitions. Peter is a long-time friend of the Foundation who has witnessed the world-changing innovations that have resulted from The X PRIZE Foundation’s incentivized prizes, including the Ansari X PRIZE for Suborbital Spaceflight and the Progressive Automotive X PRIZE. 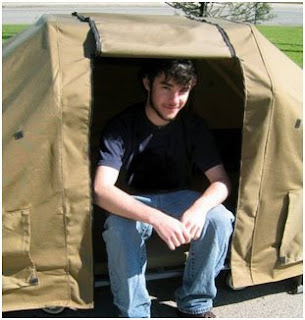 As a result of his Pasadena Art Center College of Design challenge, Peter met designers Eric Lindeman and Jason Zasa whose winning design was used to produce the first EDAR – an innovative, purpose-specific four-wheeled device that today provides shelter to hundreds of homeless individuals in Los Angeles. During the day, EDAR's are used to pursue the necessities of life. Personal belongings are stored and secured in storage baskets with removable canvas pouches. At night, the waterproof, windproof and flame-retardant unit hinges down into a sleeping unit with a metal and wood base, mattress and military-grade canvas cover that provides a robust tent-like shelter. It also features translucent windows that provide light and views of the surrounding area. EDAR’s are given free of charge to homeless individuals who are best able to benefit from their recycling and shelter capabilities. EDAR units also provide a sense of ownership and pride to those largely deprived of both. And as Peter Samuelson asks, "Well into the twenty-first century, if the best our advanced society can do for the hundreds of thousands of homeless human beings... men, women and children... who live among us is the cast-off box our refrigerator came in,what exactly does that say about us?" For more information, to make a donation or to volunteer, please visit www.edar.org.